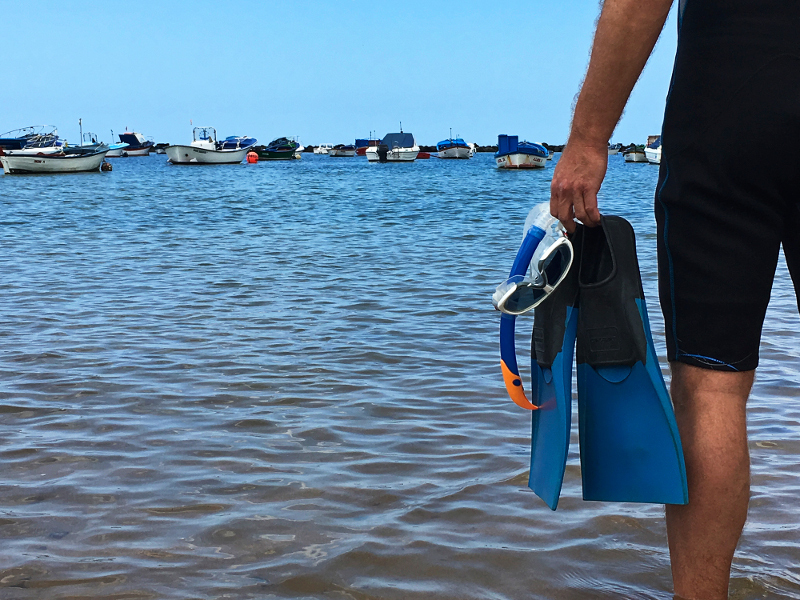 Snorkel in Las Teresitas is the easiest option to enjoy the beach seabed. We only have to equip us with diving glasses and a tube. The use of flaps, although not required, will help us to improve the experience in the calm waters of this beach. Its sand funds, shallow and well lit are the home of a great diversity of species such as sargo, salema, lisa, guede, common octopus and green sea turtle among others. Among all species that inhabit Las Teresitas we must highlight the presence of the Angel shark (Squatina squatina) which uses its funds as a breeding place and it's in serious danger of extinction. Before immersing ourselves in the water, we must check the sea state and follow the lifeguards recommendations. It's important you go at your own pace without forcing your chances. To get better visibility with your glasses, wash the mask before diving, apply saliva or toothpaste, rub well and return to wash them. Tube (snorkel) should be placed at an angle slightly back. During the dive you will notice small amounts of water from entering the tube. To release it is recommended to exhale deeply. Remember not too adjust your flats too much in order to prevent feet injuries. If you feel pressure in your ears after diving, you can remove it with the Valsalva maneuver: cover your the nose and blow gently keeping your mouth closed. You should hear a sound while that lowers pressure. Remember being always very respectful with the environment. Don't lift stones and avoid disturbing animals. Don't throw waste into the sea and, of course, take no remembrance. Do not give food to animals so you you don't modify their behavior and eating habits.